The newly published book is the most reliable guide for detecting and comprehending New Order operations mainly in the Greek-Balkan region and understanding how Scientology-like cults affect the society and national Security of every country, in which they operate. The confiscated documents of the Greek Scientology organization (KEFE/KEPHE) are the basis of this book and its strongest reliability witness. The author’s 15-year reporting experience in defence, technology, Information Warfare, etc. topics structured the documents’ revelations into a comprehensive as well as thilling book; a «must-read» in every country. The book includes a special section on NSA structure and operations and the CIA «Non Official Cover - NOC» program in relation to cult «religious» activities. It also includes a Chapter on detecting cults and guidelines on how to respond to people trapped in them. «Scientology is a social and spiritual AIDS. It infiltrates, conquers and controls key positions in the region where a Scientology centre operates, without overtly demonstrating it. In the eyes of US Intelligence Agencies, Scientology could be utilized as `Intelligence Mercenary` or as a safe space for operatives from these Agencies. For several years, CIA is implementing such a (NOC) policy. Among the seized documents in Scientology’s KEFE organization was a top secret map of the 129 Support Wing of the Hellenic Airforce, a clear violation of national security. There is a remarkable analogy between the Nazi totalitarian structure, operation and racism with those of Scientology, to the point we can regard Scientology as the most vivid historical and operational continuity of Nazism, which, however, is covered with an extensive front of aggressive public relations and ... antinazi profile». 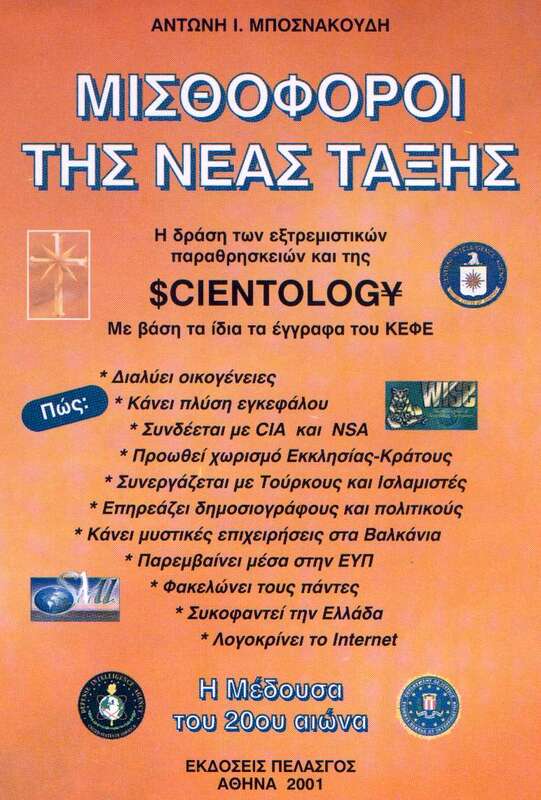 The book «New Order Mercenaries» reveals the operations of the Scientology extremist parareligion (and the one of its KEPHE Branch) both in Greece, as well as in the Balkans and Russia. It explains how (along with other similar totalitarian organizations) it affects important political and other developments, such as the movement to change the Greek Constitution, the new Identity Cards issue, the war against the Orthodox Church, the defamation against Greece for human rights violations and the defamation (Dead Agenting) campaigns against opponents. The book reveals Scientology's long term interlace with US Secret Services, CIA intervention against the Greek Intelligence Agency (EYP) and Security Police for the benefit of such extremist parareligions. It brings light to Scientology's dark operations in Albania, Yugoslavia and even in Kosovo since the beginning of the '90s. It presents in detail the brainwashing and mind control techniques which Scientology applies to its members and how they apply them in their environment as «handling programs». It includes a «Survival Guide» to recognize such extremist cults and ways of assistance to people trapped in them. It reveals Scientology’s infiltration into the «human rights movement» and its cooperation with journalist circles such as the ELEFTHEROTYPIA newspaper (Sunday Virus, etc. ), ETHNOS (Rafailides), etc. as well as with political areas especially within the SYNASPISMOS (Coalition of the Left and Progress), PASOK (Panhellenic Socialist Movement) and partially the New Democracy parties. It proves the relations of Justice Minister Mr. Stathopoulos, Education & Religious Affairs Minister Mr. Efthimiou, Foreign Affairs Minister Mr. Papandreou and the socialist Deputy Mr. Loverdos, with Scientology, its PANIFE satellite organization and the «Helsinki Watch» which enjoys the support of the «pro-Hellenic» money speculator George Soros. The reader will be able to comprehend the basic New Order operational mechanisms in our region and briefed on the notorious National Security Agency (NSA) of the United States. By looking at this true reality in which we live, he will probably wonder if the democracy, we think we have, is externally supervised and under condition. What does the USA do? Aleister Crowley: "The Great Beast"
Secret hierarchy of the "chosen ones"